Secretary of State Madeleine Albright's power suite of offices is on the seventh floor of the Department of State. There's a fantastic view of the Lincoln Memorial and the Washington Monument. But for several weeks each fall, the Secretary of State moves the center of American diplomatic activity to New York City to coincide with the annual gathering of diplomats from around the world who come to the opening session of the United Nations General Assemblyor "UNGA" as it is known inside the diplomatic community. 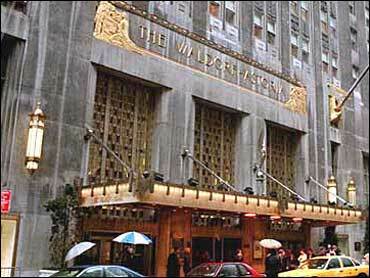 Hour after hour, day after day the foreign ministers arrive at the Secretary of State's "temporary office," New York's famed Waldorf-Astoria Hotel. The U. S. government always maintains a large apartment in the hotel's Tower wing as a home for America's Ambassador to the United Nations. But for the U.N.'s annual fall gathering, the State Department takes over a huge portion of the hotelno one will tell you exactly how many rooms, suites or business meeting roomsto use not only for housing the hundreds of State department employees who follow the Secretary to New York, but also for communications and security command centers, and for offices. It's a massive operation, but this has been going on for years, and the logistics and administrative specialists have got things down pat. On floors where American diplomats are working, the hallways are plastered with computer-generated signs indicating each room's designated use. Each geographic bureauEurope, Africa, Near East and the othershas its own workspace. A separate communications system is set up to augment the hotel's telephone system. Security is everywhere. The department's Diplomatic Security agentsboth the plainclothes agents who travel with Albright and others in uniformare bolstered by Marine Corps guards who stand at hallway sentry posts. Into this "temporary" foreign ministry protocol officers usher diplomats from around the world. It's their allotted time to see the senior diplomat from the world's only remaining superpower, and no one from Togo to Turkey wants to be left out. Over the course of Albright's 12 days in New York this month, she will have 44 separate meetings ("bi-laterals") with fellow foreign ministers from other countries, 19 meetings with groups ("multi-laterals") of foreign leaders in attendance, 15 public affairs events and will attend eight receptions, according to State Department officials. So what did Albright do at the "office" on Tuesday, September 12? At 8:30 a.m. she hosted Egyptian Foreign Minister Moussa for a working breakfast, talking about the stalled Middle East peace process. Then Albright went by motorcade to the U.N., where she paid a courtesy call on the president of the General Assembly, before addressing her fellow diplomats. In what Albright said was her last speech before the organizationwhere she once served as U.S. AmbassadorAlbright 's thmes included U N reform, making the organization's peacekeeping efforts more effective, maintaining the U.N.'s pressure on Saddam Hussein in Iraq and talking about the spread of democracy around the world. After receiving the polite applause of diplomats inside the chamber, Albright, before speeding back to the Waldorf for her next appointment, stopped in front of the cameras and held a quick press conference, taking another opportunity to blame Saddam for the plight the Iraqi people. At 11:15 a.m., the schedule said it was time to see Greek Foreign Minister George Papandreou. Noon was the appointed slot for Turkish Foreign Minister Ýsmail Cem. Later, a State Department official would say the conversation with Papandreou centered on his recent trip to Serbia, where he met with Slobodan Milosovic, and the diplomatic encounter with Mr. Cem involved Turkey and the Middle East peace process, as well as human rights. Then Albright hosted a lunch for the foreign ministers of Southeastern Europe. More talk about Milosovic and the upcoming election in Serbia. At 3 p.m., she went to the offices of a New York law firm and participated in a roundtable with non-governmental human rights organizations, before moving back to her hotel and keeping appointments with the Moroccan (4:15 p.m.), Tunisian (4:40 p.m.), French (5:15 p.m.), Hungarian (6:00 p.m.), Dutch (6:45 p.m.) and Indian (7:45 p.m.) foreign ministers. The conversation at dinner (8 p.m.) involved one of Albright's pet subjects, spreading democracy around the world. It also involved seeing the foreign ministers of Chile, the Czech Republic, India, Mali, Poland and Portugal. For the Secretary of State, it was just another day at the office.